It's tempting and so easy to use your right click to download stuff off the Web – to copy or save images, text, even videos. And this content is often great material for your website copy, squeeze page, sales page or banner ad. Fair warning – in most cases this content will be protected by copyright even if there is no copyright notice, and you will need a license or a valid claim of fair use to use it, or face a possible copyright infringement claim that could result in liability of up to $150,000 in damages. The key to understanding why most content on the Web is copyright protected, even if it doesn't have a copyright notice, is sometimes referred to as “The Rule of Automatic Copyright”. How copyrights are created is really simple, and that's why it's so often misunderstood. The Copyright Act says that a work is created when it is “fixed in a tangible medium of expression”. This means that a copyrightable work of authorship is created when pen hits paper, or keystrokes are recorded into the RAM of a computer, or video is recorded. So, the fundamental rule is that copyrights are created automatically when an original work of authorship is fixed; no registration, copyright notice, or other act is required. And the copyrights vest in the author of the work. The copyright owner then controls to what extent another person can exercise the exclusive rights of a copyright owner – the rights to copy, modify (create derivative works), distribute, display, and perform the work. And very important, if you exercise of any of these exclusive right without permission (a license) or a valid claim of fair use, you're a copyright infringer subjecting you to claims for damages, in addition to other remedies. Fair use is a basic principle of copyright law that says that the general public may use certain portions of a copyrighted work without a license from the copyright owner, provided the use is for purposes such as commentary, criticism, search engines, news reporting, research, teaching, library archiving or scholarship. The catch is that if the copyright owner disagrees with the validity of your fair use claim, you may have a copyright infringement lawsuit on your hands. The process of weighing and applying the four factors is fact intensive, and there is no bright line test. For example, with the first factor, a key question that weighs in favor of fair use is whether you have transformed the portion of the original work by adding new expression or meaning, such as with a parody, or by adding independently created images to quotes taken from a copyrighted article or speech. Probably the most significant of the four factors in the context of use in connection with promotional material for your website copy, squeeze page, sales page or banner ad is the fourth factor – the effect on the potential market for the copyrighted work. One final tip – don't fall into the trap of believing that if you acknowledge the copyright owner of the source material, your use is a fair use. On the one hand, acknowledgement may be a point to consider in weighing the four factors, but in and of itself it won't protect against an infringement claim. And what's even worse, it may even create additional legal claims involving infringement of privacy rights. Bottom line, it's very risky to freely use your right click to download stuff off the Web. Copyrights to Images, text, and videos are almost always vested in someone. And the fair use defense to copyright infringement is very limited in scope, and generally poorly adapted for use with your website copy, squeeze page, sales page or banner ad. It's always best to get a license. That's the only way to be sure that you'll not be facing a copyright infringement claim and a possible claim of up to $150,000 per work. 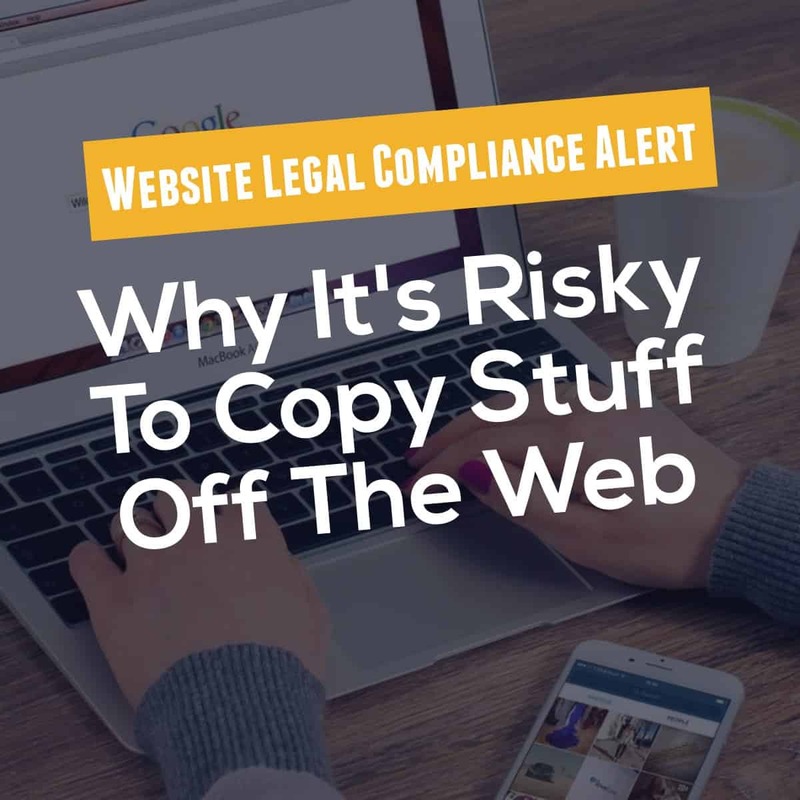 Is your website legal? Do you comply with new FTC regs? Do you have a real solution for website legal compliance you can really have confidence in? Unleash incredibly simple and easy intelligent online virtual legal assistant for 29 minutes and protect your business, products, and profits. Website legal compliance made simple by leading Internet attorney Chip Cooper.